ARCHIE COMICS has redesigned and improved its digital comics app in order to provide our fans with a better reading experience, greater variety, and, of course, more comics! An all-new comics reader for a streamlined, improved reading experience. New navigation options to help you browse by imprint, series, best-sellers, and most popular – and the ability to search directly for the comics of your choice. The new app includes comics and graphic novels from ARCHIE, ARCHIE HORROR, DARK CIRCLE COMICS, and MEGA MAN. No more app switching! In addition to our regular comics, the new app features comics that are only available digitally, like the PEP DIGITAL series and our line of DOLLAR DIGESTS! Access to ARCHIE UNLIMITED – an “all you can read” subscription service available exclusively in the new Archie Comics App! Where can I get the new Archie app? The Archie Comics App is available for iOS and Android with other versions launching soon! What happened to the previous Archie Comics app? The previous Archie Comics app was discontinued. What can we say? Times change. I had the previous Archie Comics app. Does my collection transfer to the new app? How do I get my books there? Update your existing Archie Comics App (powered by iVerse). Follow the steps in the updated app using the same email address you used for any previous Archie Comics registration. Create a new account in the new Archie Comics app – again using the same email address you used to register for the previous Archie Comics app. However! The new Archie Comics app is powered by Madefire. If you already have a Madefire account, you can go to “I have an Account” and sign in using that information. Once you register with the correct email address, go into the new Archie Comics app. Sign in using the same email address and password. From the menu in the upper right hand corner select “My Books.” Under the “In the Cloud” tab you’ll see a button labeled “Restore Purchases”. Tap that button, and you are that’s it! Regardless of which App you were using, if you have any problems or questions just send us an email! If I’m signing up for a new account, what do you do with my data? What’s this about ARCHIE UNLIMITED? ARCHIE UNLIMITED is our digital comics subscription service. For a single, monthly fee you get access to thousands of comics in the new app. You can explore an all-new series or binge the classic library. New comics are added weekly so the list of ARCHIE UNLIMITED eligible comics continues to grow. You can even download up to six comics to your device for offline reading, swapping them out as often as you like. Incidentally, we’re the first comics app to feature a la cart purchases and digital subscriptions in a single app! Convenience! ARCHIE UNLIMITED sounds neat. Where do I sign up? Do I need a certain type of smart phone or tablet to use the new Archie App? Probably not. Most current iOS and Android devices will support the new app. I already read comics using another digital comics service. 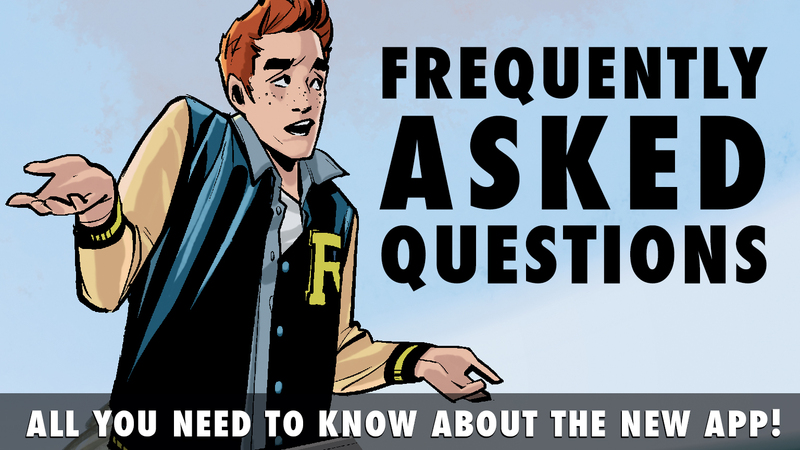 Does the new Archie Comics App affect me? Nope! Archie is committed to making our library available wherever our fans like to read. You can find Archie Comics on Madefire, iVerse, ComiXology, Amazon, the Apple iBookstore, Barnes & Noble, Scribd, and as digital books in public libraries. We’re always looking to expand! I have a question but you didn’t answer it here. What do I do now?